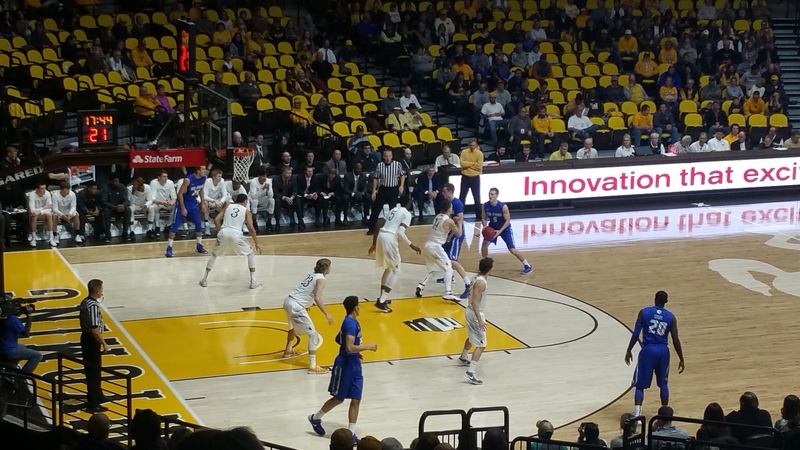 Senior guard Josh Adams posted the second double-double of his career with 20 points and 10 rebounds to propel the University of Wyoming men’s basketball team to a 64-52 win over Air Force on Wednesday night in the Arena-Auditorium. The Cowboys (8-8, 1-2 MW) trailed the Falcons (10-5, 1-1 MW) by one midway through the second, but outscored them by 11 down the stretch. The Pokes built a 15-point lead early in the second half, before the Falcons used a 16-2 run to cut the lead to 42-41 with just under 11 minutes remaining. That’s when sophomore guard Alexander Aka Gorski hit a three. The spark led to a 22-11 Wyoming run over the final 10 minutes that put the Pokes up double digits with six minutes left and well in control. Adams posted his 12th 20-point effort this season and tied a career high with 10 rebounds. His other double-double this season was 37 points and 10 boards versus Marshall on Dec. 21. Playing just one day before his birthday, sophomore guard Jeremy Lieberman earned the starting nod and chipped in a career-high 13 points. That included a career-high four threes to go with a team-high three assists in a career-high 34 minutes. Junior guard Jason McManamen reached double figures for the sixth time in the last seven contests with 10 points against the Falcons. Sophomore forward Hayden Dalton grabbed a career-high seven rebounds. As a team, Wyoming shot 43 percent (22-of-51) from the field, 39 percent (11-of-28) beyond the arc and 75 percent (9-of-12) at the charity stripe. The Pokes’ 11 threes were their second-most this season. Air Force hit 37 percent (20-of-54) from the field and 33 percent (6-of-18) from deep. The Cowboys had their second-highest rebounding margin this season with a 38-31 advantage on the boards and a 16-7 lead in points off turnovers. The Cowboys and Falcons went back-and-forth in the opening 10 minutes of the first half, before redshirt sophomore guard Trey Washington III sank a three to spark an 18-2 Wyoming run that put the Pokes up by 12 and led to a 31-23 halftime lead. Adams had eight points and five rebounds in the first half, while Lieberman added six points. The Pokes host UNLV on Saturday at 4 p.m. MT in the Arena-Auditorium.